Update March 4: Researchers at University of California schools may soon lose access to research appearing in journals published by Elsevier, one of the largest academic publishers in the world. UC announced on Thursday that it was not renewing its subscriptions with the academic publishing giant. The two sides had been in drawn-out negotiations to forge a new deal after extensions were granted upon the expiration of the old contract at the end of last year. Free access to UC research paid for by public funds was a major sticking point during the negotiations. "Despite months of contract negotiations, Elsevier was unwilling to meet UC’s key goal: securing universal open access to UC research while containing the rapidly escalating costs associated with for-profit journals," UC said in its announcement. Randy Schekman, a professor of molecular and cell biology at UC Berkeley, explained the university's position on "KQED Forum" last month. "Very often ... physicians who are not connected to an institution that may have a license for scientific literature will not have the ability to read a paper on a subject of direct relevance to their clinical practice," Schekman said. "They'll find they have to pay a fee of $30 or more to a journal published by Elsevier or Springer Nature just for the privilege of reading a paper. "This is largely work that has been funded, in the case of the U.S., by the National Institutes of Health. That is, by taxpayer funds." Meanwhile, UC's Office of Scholarly Communications has posted a web page called "Alternative Access to Elsevier Communications." "Elsevier is expected to begin limiting UC’s access to new articles through its online platform, ScienceDirect, possibly very soon," the post says. "If Elsevier were to reduce access to subscribed content, access to articles published from 2019 forward, as well as a limited amount of historical content, would no longer be available directly on Elsevier’s ScienceDirect platform." The page goes on to list four alternatives to accessing papers published by one of Elseiver's titles, including searching for open access copies, contacting authors, and securing them from libraries. The UC Berkeley Library also has a page up delineating which Elsevier content will and won't be affected. 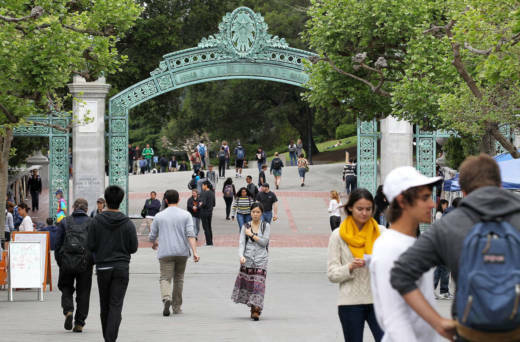 The University of California is trying to negotiate free public access to scientific research conducted by its publicly funded schools. UC, which publishes about 10 percent of the country's science studies, paid more than $10 million in 2018 to access and publish its own research in journals owned by the academic publishing giant Elsevier. "Open access" has been a major sticking point during UC's contract negotiations with Elsevier. The previous contract expired at the end of 2018, but access to the publisher's journals was extended to the end of January. Representatives from both UC and from Elsevier's advisory board joined KQED Forum host Michael Krasny last week to discuss the debate over open access and who gets to set the terms for the scientific publishing industry. Here are excepts from their conversation, edited for length and clarity. What does the term "open access" mean? Randy Schekman (professor of molecular and cell biology, UC Berkeley): Open access is the idea that scientific literature paid for largely by public taxpayer funds should be available for all. Not only to those at universities, but also to the public. Very often, for instance, physicians who are not connected to an institution that may have a license for scientific literature will not have the ability to read a paper on a subject of direct relevance to their clinical practice. They'll find they have to pay a fee of $30 or more to a journal published by Elsevier or Springer Nature just for the privilege of reading a paper. This is largely work that has been funded, in the case of the U.S., by the National Institutes of Health. That is, by taxpayer funds. So those of us who are associated with the open access movement feel very strongly that it's about time that people have access to the literature that they paid for. Lower subscription prices were also an issue. Elseiver "has one of the highest profit margins of any company in the world -- the profit margin is higher than Apple's," said Jeff MacKie-Mason, co-chair, of UC's Publisher Negotiation Task Force, on the same program. "So Elsevier is getting an enormous amount of profit out of what they're charging us to read articles that, to a large extent, we wrote." What is the University of California asking for in its contract negotiations with Elsevier? Jeff MacKie-Mason (university librarian, UC Berkeley, and co-chair, UC Publisher Negotiation Task Force): We have two main goals. One is what we call "default open access" for all publications by University of California authors. By default, we mean that unless the author objects and chooses not to publish open access, their research will be available to the entire world for free. We'll still pay Elsevier money to publish it, but nobody will have to pay to read it. In the proposal, we offer authors the option to opt out of that. The second thing is that Elsevier is a for-profit company. It has one of the highest profit margins of any company in the world -- the profit margin is higher than Apple's. So Elsevier is getting an enormous amount of profit out of what they're charging us to read articles that, to a large extent, we wrote. And so we would like to see lower prices as well. How does Elsevier see open access? Rick Anderson (associate dean, University of Utah Library, and member of Elsevier advisory board): I should clarify upfront that while I do serve on Elsevier's advisory board, I am not representing Elsevier in any way. I'm not advocating for Elsevier. As far as the question of public money, the reality is a little more complicated. Public money pays for the research to be conducted. The gap then comes between what happens after the research has been completed and a publishable article is prepared by the publisher. It's not as simple as 'the public has paid for the research so the public ought to have access to the research.' What you're getting is access to a product that is created after the research is done. Publishers do an awful lot more than just a little bit of editing and then putting the articles online. The peer review process is very involved and expensive to manage. The rejection of papers is also an expensive process. Managing the submission process, monitoring for plagiarism, archiving and curating the published content, managing compliance with funder requirements, applying and managing metadata -- these are all things that publishers do that add value to manuscripts. Randy Schekman (UC Berkeley): There are legitimate expenses. But all these things are done by all journals, not just the Elsevier journals. All journals rely to a large extent on free labor provided by academics, who do most of the reviewing for the journals as part of their academic responsibility. So the question is not, 'Are there other legitimate expenses?' Absolutely there are. But other journals find other ways to publish without the very large profit margin that Elsevier enjoys. Rick Anderson (Elsevier advisory board): Are Elsevier journals worth what they cost? That's a completely legitimate question that every subscriber to Elsevier journals has to ask and every library has to ask as it considers renewing. The UC system, like many libraries, has what Elsevier calls a 'big DEAL' package. It's basically access to their entire journal list at a deeply discounted per unit price, but of course at a very high cost for the whole package. Nobody is required to subscribe to the big deal. Elsevier continues to sell individual subscriptions to any individual or library who wants them. So the fact that UC is in tough negotiations with Elsevier right now over the terms of their big deal renewal is what libraries as consumers in the scholarly communication ecosystem ought to do. What's the outlook for the negotiaions between UC and Berkeley, and the academic publishing industry at large? Jeff MacKie-Mason (UC Publisher Negotiation Task Force): Elsevier and many other publishers have been raising prices above the rate of general inflation, which has been really devastating to university budgets, which have been declining over the past 15 years. University library budgets are declining even faster. And the publishers have been raising prices faster than inflation. We're not the only ones negotiating with Elsevier in this fashion. The entire nation of Germany has canceled its contract with Elsevier. Last spring, the nation of Sweden also canceled. Florida State canceled their contract last year. So there's a lot of pressure and we think that the leverage is growing largely because the economics don't make sense anymore. Elsevier supports open access and a more inclusive, collaborative, and transparent world of research through open science. Elsevier is also strongly supportive of our authors having options to publish their work for free, as around 85% of them currently prefer, or to choose to have to pay a fee to publish. We serve the needs of customers and researchers around the globe so we have to be careful about uprooting the way most researchers prefer to publish for free in well regarded journals.